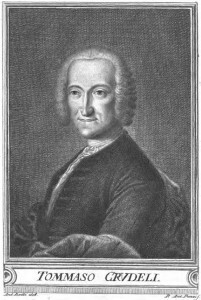 Tommaso Baldasarre Crudeli (Poppi, December 21, 1702 – Poppi, March 27, 1745) was a Tuscan free thinker who was imprisoned by the Sant’Uffizio (Roman Inquisition) in Florence. He was a poet, lawyer, champion of free thought and is remembered as the First Martyr of Universal Freemasonry. University of Pisa continuously since 1502. 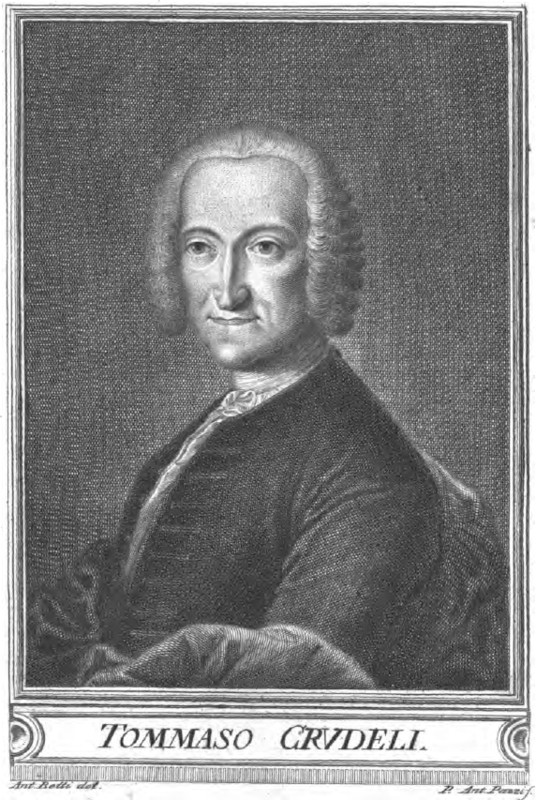 Tommaso was the seventh graduating in “Utroque jure” in Pisa in 1726. His mentor was Bernardo Tanucci (Premier of Naples and Sicily Kingdom) during the preparation of studies and university years; in Pisa he had strong relationships with teachers and colleagues for cultural affinities Lucretian and above the nascent Enlightenment. Tommaso moved to Venice at the family of the Counts Contarini and then he returned to Florence as professor of Italian for English Colony. For his lively intellect and his boldness, Tommaso was brought into the English Lodge, first Masonic Lodge in Italy and dependant from Grand Lodge of England, in which he was initiated on May 5, 1735. He became secretary, but also a scapegoat for a strong conflict between the Vatican and the English Freemasonry, who began in Florence at the end of the long dynasty of the Medici trying to establish the Lorraine, titled dynastically, to change the political destiny of the Grand Duchy. He was arrested for suspicion of heresy or worse to be the bearer of heresies, was left in prison in total darkness and without air for three months. He was interrogated for two days on “francmassonery” but he did not cooperate and he would not sign the papers falsely noted his guilt so he was thrown in encarcerated again for another four months in inhumane conditions. Questioned again about the aims of Freemasonry Lodge in Florence, members names of Lodge and Masonic rituals, he would not comply. He was sent back to jail even though his body was tried and he was vomiting blood. Meanwhile his father, Atto Crudeli, pleading the liberty for his child, sadly he died of a broken heart for sorrow. Before Christmas, the brother Antonio clumsily attempted to free Tommaso, with a daring plan that ended in the before it was started. The Inquisitor interpreted the plan as proof of guilt and was convinced even more the need to pursue the prisoner. Subsequently, the inquisitors carried him near death to the prison at the Fortezza da Basso in Florence where he spent three months. In August 1740, in a church parade in black, they did ask him to recant accepting his gasp as explicit consent. After the sentence came the partial grace that provided the compulsory residence in his home until the end of his life with a series of religious obligations that Tommaso never fulfilled. Meanwhile all of Florence was in turmoil and especially the Governor, the Prime Minister, the Minister of Justice, Brothers of the Lodge; even the Grand Lodge of England mobilized giving the King of these facts, among others touched British interests in the dynastic succession in Europe. The Grand Duke of Tuscany (he also Mason) asked for a report from Tommaso. Because he had some bed rest but was still sick and dying, Tommaso was able to dictate a detailed report which was why Francis Stephen of Lorraine, husband of Maria Theresa of Austria in 1742 closed the Inquisition Tribunal forever (next to the Basilica of Santa Croce) and after five years had it demolished. Meanwhile Tommaso died in his bed because of the after-effects of imprisonment, March 27, 1745. He did have the satisfaction of seeing the Inquisition abolished by the secular power, first in the Catholic world. The “Antica Condanna” which in fact was the first conviction by the Papal Bull of April 1738, was heard for many decades in which the writings and poems of Tommaso Crudeli were scattered as it was altered many times the relationship on the basis of which the Grand Duke did close the Inquisition Tribunal.